Koi Ponds - For the Child in Us All - Aquascape, Inc. Growing up, I was what they call today a ‘free-range’ kid. Like most children back then, I was free to explore the outdoors on my own and interact with nature. Things are different today. Parents and child caretakers are far more cautious about letting children wander on their own. This is one reason, I believe, why koi ponds have skyrocketed in appeal. Through them, Mother Nature’s best experiences are brought right to our own backyards. For sure, kids love watching and feeding colorful pond fish. Koi are gentle creatures that will swim right up to be fed, accepting food directly from the hand. And since it’s better to feed them in small amounts throughout the day, pretty much any time the kids are free, it’s a good time for the koi, too. Backyard ponds attract other wildlife that children love: frogs, salamanders — basically any amphibian that lay their eggs in or near water. Plus birds will flock there, including song birds. However, predatory birds like heron may be attracted to the koi. There are steps you can take to dissuade them, like netting, decoys, and electronic scarecrows with sensors that spray water when they catch movement. Also, thoughtful landscaping can provide protection as herons prefer an unobstructed path to wade into the water. And from the outset, having the right depth of water in the pond (no less than 24″) is key to keeping heron at bay. My favorite koi ponds are the larger ‘swimming ponds.’ Children can snorkel in these and get up face to face with the fish. For swimming, you want clean water, so I’d recommend not overstocking your pond. 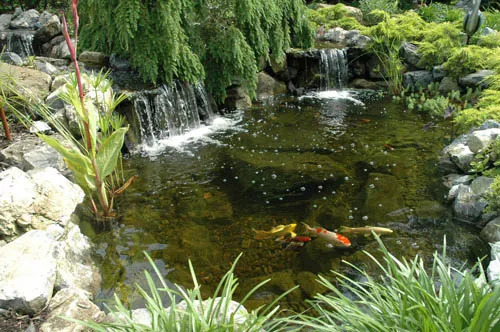 You don’t want more fish waste than can be reasonably absorbed by aquatic plants and the pond’s bog filtration system. Now while there are a few things to consider, with a little care, koi ponds are ideal to bring out the child in us all. Even today, when a pond is large enough, I can’t resist a swim. So I say … go ahead … be a ‘helicopter’ parent or grandparent, and hover over the kids. With a backyard koi pond, kids aren’t missing out on much at all.